JMRI Signals Masts are managed in the Signal Mast Table. You access this tool from the Tools > Tables > Signal Masts menu. Delete, click on this button to delete a Signal Mast. Use with care! Edit, clicking on one of these buttons opens a panel where you can disable some of the available Aspects and the Lit status for this Signal Mast. Note: The System Name, Signal Mast type and driver cannot be changed once a Signal Mast has been created. Held, if this property is checked the Signal Mast will not follow the Signal Mast Logic e.g. to hold a train at this location waiting for orders. 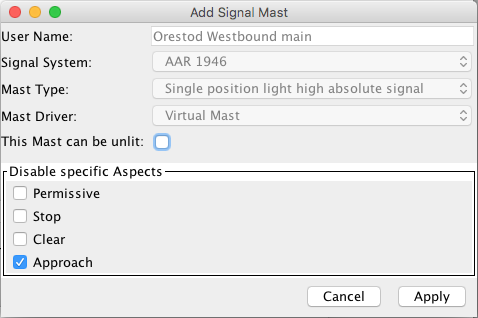 To define a new Signal Mast, click on the "Add.." button below the Signal Mast Table. The window that opens next will prompt you for whatever setup information is needed. After you clicked on one of the "Edit Logic" buttons in the Signal Mast Table, the Signaling Pairs window appears. Choose one of the displayed lines and click the "Edit" button to open the Edit window. For more information on Aspect Signaling, see the Aspect Signaling introduction. Back to the Signal Mast help intro.